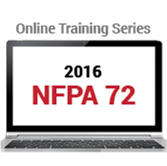 Launch your fire alarm and signaling systems training with the updated 2016 NFPA 72 Online Series. Learn about the 2016 edition of NFPA 72 at your own pace, on your own time. Created by the leading experts in NFPA® code compliance, this fully updated, six-part online series spans every aspect of fire alarm and signaling from design to inspection, testing, and maintenance. Courses cover new technology and the applicable requirements from building, fire, and life safety codes including the 2016 edition of NFPA 72, National Fire Alarm and Signaling Code and the 2014 edition of NFPA 70®, National Electrical Code® (NEC®). Each one-hour course ends with an exam to test your knowledge. Pass the online exam to qualify for 0.1 CEU per course or 0.6 CEUs in all. Work at your own pace through in-depth online courses focused on individual subject areas. Developed by industry experts, these self-guided courses pave the way for additional professional training from NFPA, the fire safety leader and code source. Anyone whose job involves designing, reviewing, evaluating or installing fire alarm systems, including: designers, installers, electrical contractors, architects, auditors, and project managers. Understand the basics of fire alarm systems and how NFPA 72 interacts with building, fire, and life safety codes. Learn at your own pace, on your own time, with Fire Alarm Basics -- the first training in the six-part NFPA 72: National Fire Alarm and Signaling Code (2016) Online Training Series. This updated training provides you with a greater understanding of fire detection and alarm systems required by today's codes, and how various situations dictate different system features. You'll understand how NFPA 72 is referenced by building, fire, and life safety codes and how they incorporate NFPA 72 to design, install, and maintain a fire alarm system. Fire Alarm Basics consists of three lessons to provide a thorough overview of what makes up a fire alarm system. The training covers the basic configurations and terminology used in the industry for fire detection and alarm systems; and how environmental and system conditions trigger various signals such as alarm, trouble, and supervisory signals -- which are then used to initiate responses or behavior. Fire Alarm Basics also focuses on power supply requirements and circuits that drive and connect the building blocks of fire alarm systems. Complete this one-hour course and qualify for 0.1 CEU. Upon successful completion of the course, participants will be prompted to download the CEU certificate directly from the course site. Based on the 2016 edition of NFPA 72®, the updated Initiating Devices Online Training introduces how to select and use basic fire alarm system initiating devices. In today's field, a working knowledge of fire alarm initiating devices is critical! Part of the six-part NFPA 72: National Fire Alarm and Signaling Code (2016) Online Training Series, Initiating Devices addresses the devices used to manually or automatically signal a fire alarm system to initiate responses from equipment and people. Self-paced training developed by experts in NFPA 72 covers the most common types of initiating devices and their operating features -- providing you with an understanding of how to properly select and apply basic fire alarm initiating devices. Work at your own pace online to learn about manual fire alarm boxes, heat detectors, smoke detectors, waterflow switches, and valve tamper switches. The training also introduces the concepts of initiating device spacing and location. Updated for the 2016 edition of NFPA 72, the new Notification Appliances Online Training covers both audible and visible notification appliances. Audible and visible notification can be used to trigger the desired occupant behavior, so the success of every system depends on their correct application. Part of the six-part NFPA 72: National Fire Alarm and Signaling Code (2016) Online Training Series, the Notification Appliances training covers appliances that are used to alert and inform building occupants and fire alarm system users. You'll also learn about special terminology used for audible signaling and for visible signaling. Work at your own pace through lessons from the same experts who helped develop the 2016 edition of NFPA 72. When discussing audible and visible signaling, the lessons will cover requirements for both public mode and for private mode notification. This training will also provide an overview of other types of notification appliances that you might use in special applications. Get an up-to-date, comprehensive introduction to fire alarm circuits, fire alarm power circuits and pathways, plus NFPA 72 and NEC® requirements. A key component of the NFPA 72: National Fire Alarm and Signaling Code (2016) Online Training Series, Fire Alarm Circuits and Pathways covers the various types of circuits used for fire detection and alarm systems. Working online at your own pace, you'll learn about the three basic fire alarm circuits used to connect initiating devices and notification appliances to fire alarm control units, and those used to interconnect different control units in the same system. Curriculum based on the latest NFPA 72 also covers control circuits that are used to trigger other emergency control functions. Training addresses fire alarm power circuits and pathways, which can provide power to certain types of detectors, notification appliances, relays, or other devices. This includes coverage of the new circuit designation called Class N pathways, permitting the use of networks and Ethernet when interconnecting a fire alarm system. A key characteristic of fire alarm power circuits is that the power is derived from the fire alarm system itself. For this reason, fire alarm power circuits are covered by the same section of the NFPA 70®: National Electrical Code® (NEC) governing basic fire alarm circuits. Circuits that provide primary AC power are not considered fire alarm power circuits. Learn about off-premises fire alarm and emergency system monitoring and reporting in accordance with the new NFPA 72. Updated for the 2016 edition of NFPA 72, Off-Premises Signaling Online Training shows how supervising station alarm systems and public emergency alarm reporting systems are used to monitor building fire alarm and signaling systems at off-premises locations. You'll understand how these systems assure timely notification and provide specific information to individuals or organizations that will take action upon receipt of the signals. Learn the key differences between systems, how systems are used, and which NFPA® codes and standards apply. Communications technologies used by public emergency alarm reporting systems differ from those used by supervising station alarm systems and are addressed by a separate chapter in NFPA 72: National Fire Alarm and Signaling Code. In addition, facilities that receive signals from a public emergency alarm reporting system fall under NFPA 1221: Standard for the Installation, Maintenance, and Use of Emergency Services Communications Systems. Part of the six-part NFPA 72: National Fire Alarm and Signaling Code (2016) Online Training Series, this training covers all types of systems and introduces the different types of transmitters and communications methods permitted for supervising station alarm systems. General requirements for system performance, management, and use are also covered. Learn how to apply NFPA 72 requirements for inspection, testing, and maintenance to ensure dependable fire alarm and emergency systems. Proper inspection, testing, and maintenance are critical to signaling system effectiveness. The final training in the revised and updated six-part NFPA 72: National Fire Alarm and Signaling Code (2016) Online Training Series covers Code requirements for inspecting, testing, and maintaining fire alarm systems. The lessons review general provisions in NFPA 72 involving management of inspections, tests, and system impairments. The training also addresses personnel responsibilities and qualifications. Learn how the Code requirements for acceptance, periodic inspections, and tests differ from one another. These differences result in specific qualification requirements for the persons doing the work. Most of the actual test methods for fire alarm equipment do not vary for new work versus periodic testing; however, some testing requirements for new work do not apply to existing systems. In this training, you'll learn how to navigate NFPA 72 to locate specific requirements and frequencies for the testing and visual inspection of fire detection and alarm system components. Specific requirements for properly conducting smoke detector functional and sensitivity tests are covered in detail, as well as test methods for several other common types of initiating devices. Last but not least, you will gain insight into how some commonly employed test methods do not meet the requirements of the Code.